"My career as a manager took me to Carlisle, Grimsby, Workington and Huddersfield, but during my time with those clubs I never felt that Matt Busby or Stan Cullis, at Wolves, were better managers than me. Not for one minute. I don't mean to brag or boast. Matt and Stan are brilliant men but I knew I had a system of playing and a system of training and I was clever enough to go on with it. I also knew how to deal with people. I don't like to domineer over people. I like them to respect me. I could speak common sense about the game and I could spot a player." When Bill Shankly arrived at Anfield in 1959, Liverpool were in the second division and going nowhere. The training ground, Melwood was a shambles, Anfield not a pretty sight and Liverpool overburdened with average players, but with quality players in the reserves. Shankly was immediately at home here as he sensed in the huge crowds a kinship with the supporters from the word go. They were his kind of people. With the backing of Bob Paisley and Joe Fagan and the enthusiasm of the fans behind him he set about rebuilding the team. "But after only one match I knew that the team as a whole was not good enough. I made up my mind that we needed strengthening through the middle, a goalkeeper and a centre half who between them could stop goals, and somebody up front to create goals and score them." Shankly first had to convince the directors at the club that Liverpool should spare no expense in strengthening the team. "I used to fight and argue and fight and argue and fight and argue until I thought: 'Is it worthwhile, all this fighting and arguing?' It is bad enough fighting against the opposition to win points, but the internal fights to make people realize what we were working for took me close to leaving many times." Shankly had cleared the squad of any dead wood, "Within a month I had put down twenty four names of players I thought should go and they went inside a year." Finally 18 months after he took over at Liverpool in came Yeats and St John, two players he had wanted at Huddersfield. Shankly was quite confident that they would prove key signings. "St John and Yeats were both twenty-three, and I said to Mr Sawyer (Liverpool's financial director), 'You sack me if they can't play. I'm telling you now, I'll stake my life on it.' And I told Mr Reakes, 'These players will not only win us promotion, they will win us the Cup as well.'" Liverpool were ready for promotion and with Roger Hunt scoring 41 goals, St John adding 18 with Ron Yeats keeping together the defence they won their place back in the top flight in the 1961-62. Shankly was pleased, but had bigger ambitions for Liverpool. "When we won promotion to the First Division I went to a shareholders' meeting and they were so thrilled about it that they presented us with cigarette boxes. I told them, 'We got promotion, but you don't think that is satisfactory, do you?' Next time we come back here for presents we will have won the Big League, the First Division.' They looked at me the way the officer in the RAF had done when I told him I wanted to leave to play for Scotland against England, as if to say, 'We've got a right one here.'" A season of consolidation followed in which Liverpool finished 8th, the only problem being Everton finishing as champions. As would happen again twenty years down the line, Liverpool and Everton were about to carve up the domestic honours between them in the next five or six seasons, but as the 63-64 season started, it was Everton who were top dogs on Merseyside, a fact that rankled with Shankly. In 1963-64 Liverpool won the league with the nucleus of side that had gained promotion two seasons previously still in place. "In 1963-64 I made good my promise to the shareholders to return with the League championship. At Easter I said, 'Right, boys, we've jogged along nicely. Let's go out and get it going. Never mind anything that happens, off you go!' We won seven games on the trot, running through teams and tearing them to pieces, and we rounded things off by drubbing Arsenal 5-0 at Anfield." The following season Liverpool finished a disappointing seventh in the League with 13 less points than the previous season. Liverpool's participation in the European Cup took a lot of energy from them, only denied at the semi-final stage due to a dishonest referee in Milan. Liverpool were also doing brilliantly in the FA Cup, reaching their third final in the club's history. Liverpool had lost both their FA Cup finals to date in 1914 and 1950, but Shankly finally managed to bring the Cup home. "It was a wet day, raining and splashing, and my shoes and pants were covered in white from the chalk off the pitch as I walked up to the end of the ground where our supporters were massed. We had beaten Leeds United and our players had the arena, but I took off my coat and went to the supporters because they had got the Cup for the first time. Grown men were crying and it was the greatest feeling any human being could have to see what we had done. There have been many proud moments. Wonderful, fantastic moments. But that was the greatest day." 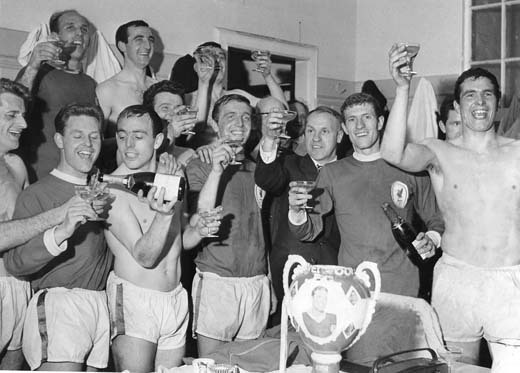 In season 65-66 they won the title again, easing up at the end, while neighbours Everton took the F.A. Cup. Liverpool lost the final of the European Cup winners Cup at Hampden Park to Borussia Dortmund. The great sixties side had gained promotion from Division 2, won the League title twice, the F.A. Cup once, and reached the ECWC final and the European Cup semi-final all inside five seasons. Shankly's mistake now was to let the side rumble on without any major rebuilding for a season or two too long. "A lot of our players were about the same age and I had given them a set time as to how long I thought they would last. I had told them, 'If you are a good athlete, your best seasons will be between twenty-eight and thirty-three. I had my best seasons during that period of my life. I thought some of them would have gone on longer than they did, because of their experience. Maybe the success they had shortened their careers. They had won the League, the FA Cup and the League again, and they had been in Europe so often. They had played everybody and done most things. Perhaps they were no longer hungry enough." "Shankly signed a boy called Jack Whitham. He was always getting injured. Training for Jack was like jogging in between injuries. He was driving Shanks mad because he hated people who were like that. Finally he said one day to Jack in training, 'You, go up to the corner (where the pigsty was) and train up there. I don't want you to contaminate the rest of the team.' Poor Jack was jogging up there in the pigsty with the smell of the pigs and all that."